Our Grand Canyon Deluxe tour takes passengers from the bustle of Las Vegas to the stunning beauty of the Grand Canyon National Park’s South Rim. 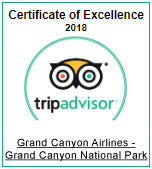 Guests familiar with the Grand Canyon may recognize the iconic vistas on this tour because the South Rim is the most visited, most famous, and most photographed of all the canyon’s accessible points. Here, the Grand Canyon is nearly 11 miles across and a full vertical mile deep. The views from the two viewpoints visited on this tour simply defy description. It’s a small wonder that Theodore Roosevelt, the 26th President of the United States and lifelong lover of the Grand Canyon, said: "Leave it as it is. You cannot improve on it. The ages have been at work on it, and man can only mar it. What you can do is to keep it for your children, and for all who come after you, as the one great sight which every American... should see." Arrive at our state-of-the-art terminal for check in. 1 hour 10 minute journey includes aerial views of Hoover Dam, Lake Mead, and the Grand Canyon. Visit two of the most popular viewpoints with 20-30 minutes of time for exploration and picture taking at each location. A box lunch will also be provided. 1 hour 10 minute flight back to the terminal. Once you are back you will board a waiting motorcoach for return to your Las Vegas hotel.